With even Bank of England head Mark Carney admitting UK housing prices may be a little bubbley (and affordability plumbing new depths), RT reports that a hostel in east London has come up with the ingenious idea, to try and solve homelessness amid soaring rents in the British capital, of converting a shipping container from China into a tiny low cost home for hard up and desperate Londoners. The boxes, called mYpads, cost GBP75 per week - around one-quarter of the rent of most distant yet commutable borough in London - and are affordable for even those on minimum wage. Although it’s only a steel box, they are calling it mYpad, as notwithstanding how small it is, it’s a compact home with a tiny kitchen, bathroom and living quarters complete with a flat screen TV and a single bed. Lying on your bed, you could almost imagine you were in a bunk on a ship, perhaps the one on which the containers were transported. But as rents in London continue to soar, putting most flats and houses out of reach of many people on low incomes or benefits, these may be part of the solution. A mYpad costs just £75 a week. While in some parts of the UK this is cheap but not a giveaway, in London it’s unheard of. In the British capital the average rent, even in a distant borough where oligarchs wouldn’t venture, alive or dead, is around £300 a week. At 30% of the minimum wage, mYpad is affordable to those who need it most. Louise Stephenson used to live in a hostel but will be one of the first mYpad tenants. “I think it’s difficult for anyone right now to get comfortable accommodation at a good price, without paying extortionate amounts of rent,” she told RT’s Sarah Firth. 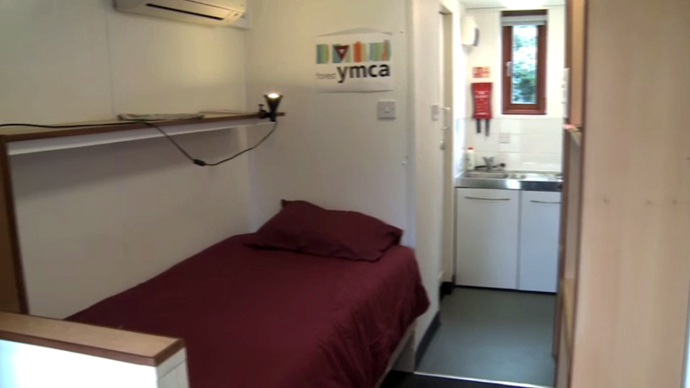 MYpad is the brainchild of Timothy Pain and the YMCA Forest hostel in Walthhamstow East London. The containers get shipped to Tilbury from China and are then sent to a company for fitting out. “Society takes the carpet out from under them, because the moment they get into work, they can’t afford to live in a hostel and they can’t afford to live anywhere else. It doesn’t make any moral or economic sense,” Pain told RT. Each container costs £20,000 and to start with they will be built at just two sites in 2014, both of which are connected to the Forest Hostel and are only for young people the charity is working with. But with some funding from the Greater London Authority, it is hoped that more charitable housing associations will take them on. While there are plans to build thirty more mYpads next year, this is not even a drop in the ocean. Unless Britain increases the rate at which it is building affordable, new homes, then by 2020 there will be a shortfall of 2 million homes in the UK. In London this means that some people may never be able to afford a home of their own.